Braided stainless steel brake line kit for 67 Mustangs with original style Kelsey Hayes 4 piston calipers. Ends are factory precision crimped to eliminate leakage. 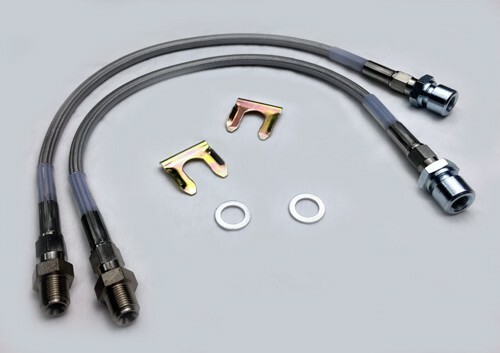 Teflon inner liner and stainless steel braid eliminates hose expansion, common to original lines resulting in better braking performance and a firmer pedal feel! Stainless steel braid is coated in a thick polymeric covering to prevent dirt and other abrasive contaminants entering the braid. This covering provides a significant increase in hose life. 2 x Adapters for the end of the hose to the calipers (7/16-24). 1967 Mustangs using original style Kelsey Hayes 4 piston cast iron calipers with 7/16" inlet.